Police officers stand in the road near the Natural History Museum, after a car mounted the pavement injuring a number of pedestrians, police said, in London, Britain October 7, 2017. 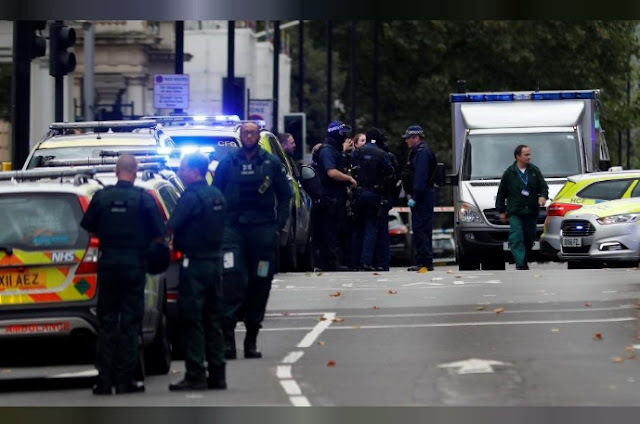 LONDON - London police said on Saturday a number of pedestrians had been injured near the city’s Natural History Museum and that a man had been detained at the scene. British media reported a car had mounted the pavement outside the tourist attraction. Police described the incident in the South Kensington area of west London as a collision and said the motive for the incident was under investigation. “Inquiries to establish the circumstances and motive are under way,” police said. The museum said on Twitter it was working with police after “a serious incident” outside and would provide more information later. The police statement said officers were on the scene and that London Ambulance Service had been called. The Ambulance Service said it was responding. Britain is on its second highest security alert level, meaning an attack by militants is considered highly likely, and there have been five attacks already this year, three involving a vehicle. Three Islamist militants drove into people on London Bridge in June before stabbing people at nearby restaurants and bars, killing eight and the same month a van was driven into worshippers near a mosque in north London which left one man dead. London police said on Saturday a number of pedestrians had been injured near the city’s Natural History Museum and that a man had been detained at the scene.